Following Rolls-Royce’s summer demonstration of shore-based vessel control (see Ship & Boat International September/October 2017, pages 12-13), Wärtsilä Marine Solutions has completed a round of transatlantic unmanned vessel tests, in which a pilot situated in San Diego, California controlled a platform supply vessel (PSV) in the North Sea, as a demonstration of the Finnish tech specialist’s self-styled “Smart Marine ecosystem”. Four hours of testing were conducted in August, during which the pilot remotely controlled Gulfmark Offshore’s 2003-built, 79.5m x 16.8m Highland Chieftain (pictured, right) from Wärtsilä’s San Diego office – spanning a distance of approximately 8,000km. 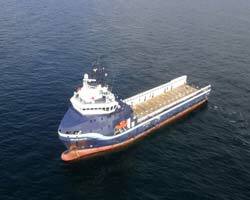 During these tests, the vessel undertook a series of manoeuvres at various speeds. The PSV had already been fitted with Wärtsilä’s NACOS Platinum integrated vessel control system, so Wärtsilä simply added some additional software to the vessel’s dynamic positioning (DP) system, enabling the routing of data, via satellite, from ship to shore. Wärtsilä adds that the solution will also be used for “other pilot projects”, including more detailed investigations into automated docking procedures, for example.